It is that time of year again, when my thoughts turn towards the new year to come. It is a good time to look back and reflect on the highs and lows of the previous year, and also what is hoped for the year to come. 2005 was a good year. There were many positives which more than offset the few negatives. I thank the Lord for giving me a wonderful wife, a great job, my health, and good friends. And of course our cat Tia! The year started off at the Washington-Lee High School track, which is where I spent every Tuesday and Thursday morning when I was in town. Let me explain … Every year I set myself different exercise goals and this year was going to be my triathlon year. I joined the Potomac River Running Club in January and started bi-weekly track sessions. The coaches of the club (Ray and Margie) are great and really know their stuff. Although I had always run, this was the first time that I did speed work and had instruction on proper form. I was amazed at the difference that regular speed training made. My 5 km pace improved by over 30 s to 6:20, and I even was able to do a timed mile in 5:34. The training was focused on the Cherry blossom race which I ran in just over 68:55 which was a sub 7 minute pace for the race. By the end of the year I had completed four races, and in training done just under 100,000 yards in the pool, 2,150 miles on the bike, and 620 miles running. Makes me tired just writing about it. A long running tradition in our family is for Lis and I go somewhere special for our wedding anniversary and we take turns organising it. We’ve been fortunate over the years that due to my travel we have been to some pretty exotic places, like the Taj Mahal. This year I decided to take Lis up to experience the winter carnival in Quebec city. For those who have not been fortunate enough to visit Queb ec city, you have missed a very special place. It is a European city plonked down in North America. With its citadel overlooking the St. Lawrence seaway, it is one of the oldest cities in North America, with buildings going back some 400 years. When we arrived at the airport Lis was shocked to see about 6 foot high snow banks along the road. The driver commented that it was a bad year for snow – normally they are twice that height. 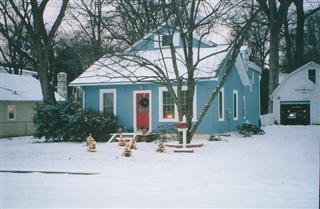 We stayed at a B&B and enjoyed wandering about the city, taking in the sights and sounds of the winter carnival. The Chateau Frontenac overlooks the St. Lawrence and is built in the style of a grand European chateau. Our digs were much more humble. 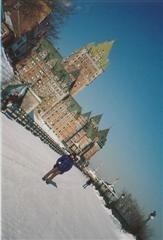 We enjoyed the ice toboggan ride on the Dufferin Terrace with the chateau in the background, where the photo to the right was taken. One of the highlights was watching the canoe race in the St. Lawrence. Before bridges linked Lévis to Quebec City, boatmen ferried mail and passengers between the two cities by halfpaddling, half dragging large wooden canoes across the St. Lawrence River’s incompletely frozen surface. Today they do it for fun, and it is quite the event. The teams drag the canoes along the ice until they hit water, then they jump in and paddle like mad, riding up on ice flows and then pushing/pulling the canoe along. The need to cross the river against the current, then travel down below where they started, and then back upstream again. 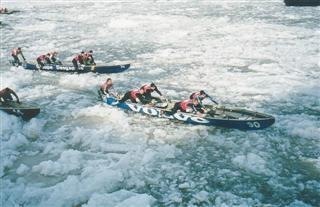 With a fast current it is very hard work, ice flows notwithstanding. 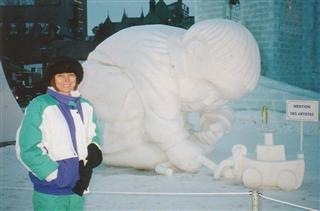 There was a snow sculpting competition which was just amazing. The people worked day (and night) to take a large, compacted block of snow a nd convert it into a sculpture. They used shovels, wire saws, and special tools for their work. Competitors came from all over, including a team from Singapore who were having a few problems. Not surprising given that they had never even seen snow before the competition! The Americans told us how they went to the Harbin winter festival in China to try ice scupting and found their tools and techniques were totally inadequate. After a couple of days of battling a Korean took pity on them and shared his titanium tools. Things went well after that. The Harbin festival’s scuptures are incredible and I’m hoping to make it there in 2006. There were other winter activites to do, such as the favorite Canadian passtime of ice skating. Growing up in the tropics Lis never learned to skate and so over the winter of 2004/5 she took ice skating lessons. I gave her a pair of scates for a birthday present as she is now fairly adept. We enjoyed wandering around the Plains of Abraham outside the city walls, as well as through the alleys of the old city. Quebec really is a very special place and I would recommend it for a holiday. 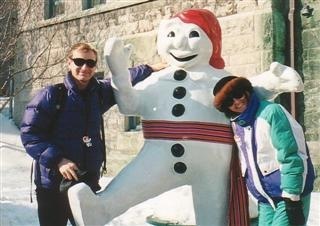 If you do go in February, be sure to dress warmly, and say hello to the Bonhomme! In 2006 it’s Lis’ turn to organize so I wonder where we will end up. My work at the World Bank has been going well. I am now focusing only on China, but that still keeps me very busy. I’ve spent a lot of time there (I’ll have over 150 days of mission travel this year). I had a full program which meant about 90 days of travel, but one of my colleagues retired and I inherited two of his projects which really bumped me up. Still, it is less stressful than having my own company, and Lis reminds me that one year I did eight months of travel! I take every second Friday off when in D.C. and generally don’t work evenings or weekends (I still manage 50-60 h week though). There is more work than I could do even if I worked 24 h a day, so I just accept that not everything will get done. I am overseeing a number of expressways that the Bank is financing. I have to monitor the construction quality, procurement, ensure the environmental and social impacts are minimized, as well as give technical guidance. The projects are each typically about US$ 700 million and they are at all stages of progress, from just starting to being completed. As a civil engineer, this sort of work is impossible to beat. 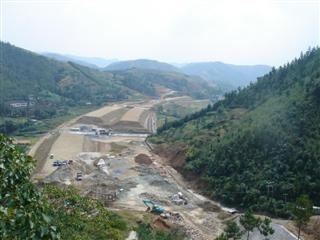 We are putting four lane expressways through the most challenging terrain you can imagine. It is very mountainous so there are lots of bridges and tunnels — typically 40% of the road is above or below ground. The photo to the right is an example of the alignment just as it exits one of the tunnels. It’s amazing to watch the tunneling. Rather than use machines, they have a small army of men with pneumatic drills boring holes which are then blown with explosives, and others move the rubble by hand into trucks. Yes, they could use machines, but it is more cost effective to do as much as possible by hand. That even extends to doing piles for bridges. With such a huge pool of labour in China it is a good thing that so many people are employed in construction. On one of my highways they calculated some 240,000 person-years of labour was involved. The women work just as hard as the men, in fact sometimes harder, so it definitely isn’t man-years. I am very lucky to have an excellent team supporting me. My Highway Engineer, Jean-Marie Braun (to the right in the adjacent photo with our colleagues from Jiangxi province), is a consultant from France with over 10 years experience on expressways in China, and even more in Europe. I’ve learned a lot sitting at his feet. I also have a great environmental specialist Anil Somani who helps to enforce the agreements we have to minimize the environmental impacts. There are others as well dealing with resettlement, procurement, financial management so my role is to manage the process, but I also get to do some engineering as well. It is great to work with such good people that I can learn from. Working in China is a challenge in many respects. Each province is different and I am fortunate to work in Hubei and Jiangxi provinces which are in the central part of China. Both the communications departments are staffed by very talented people and they are open to innovations and new ideas. When I go to China they are good hosts, and I count myself lucky to work with them. We had two groups visit Washington D.C. and Lis I were able to invite them to our home for a meal which was fun. I had my assistant Wenling order in Chinese food from a local restaurant so they weren’t inflicted with our vegetarian cooking. There was a lot left over so we gave it to our neighbours who have three teenage sons that love Chinese food. The joke now is that when Denise doesn’t feel like cooking they hope we are entertaining Chinese delegations! Just before spring they had an ‘Adventure Expo’ in D.C. which Lis and I visited. Big mistake. We s aw some enticing adventure holidays in a number of countries. 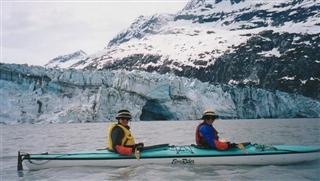 We decided to go to Alaska in May and spent a week kayaking in Glacier Bay National Park. It was fun being in such amazing wilderness, even though it was a bit cold at times! If you are interested Lis wrote a travelog on the trip which can be read by clicking here. Where next? Patagonia beckons, but we’ll see … the Expo is on again next year so we may choose something else. I’m also keen for another of my long bi-annual solo bike trips. We has Lis’ mother come and visit us for June/July. They joined me in Toronto at the end of June on my way back from China. I often route myself via Toronto as it lets me pay my parents regular visits. They are now in a very nice apartment which they thoroughly enjoy. Even more so once winter comes and the weather deteriorates. Both are in good health and good spirits which I am thankful for. I hopefully have interited some good genes given that they are both in their early 80s and still very active. 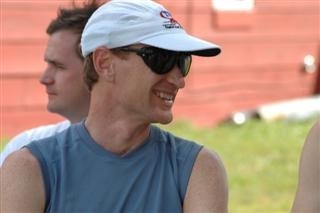 While I was in Toronto I did my first triathlon which I really enjoyed. My race report is here. My swimming was pathetic, but I did well with the riding and smoked the run with a 42 minute 10 km. The day after the race we took the ferry across to Rochester which was a nice change from driving to Niagara Falls, and then drove back to D.C. We were in a rush because early July was Lis’ High School Reunion, which she organized. Although the school was in Singapore, they have reunions every two years, alternating between the east and west coasts of the US. Lis did a great job of organizing it, and it was fun to catch up with her old friends, who are my new friends. Aila and Suzie stayed with us afterwards, which was great. However, with four women in the house (five if you include the cat) I definitely felt outnumbered. 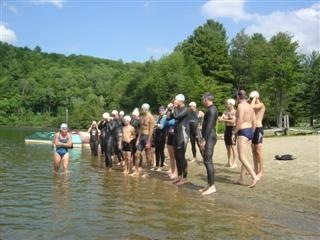 I went to Vermont (VT) in August for a triathlon camp, but the main goal was to improve my swimming. Lis and I drove up from D.C. and it was quite harrowing to get through the New York area. We went to Bennington VT for the weekend and stayed in a grand old mansion which had been converted into a bed and breakfast (B&B). VT is Lis’ favourite state as it is inhabited by very individualistic people. Those who have visited Golden Bay in New Zealand will know what I mean. I jokingly call them ‘artsie fartsies’, but Vermonters are definitely cut from a different bolt of cloth than most Americans – for example they have state health care and have worked to keep Wal-Mart out of the state. 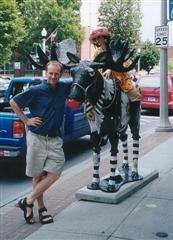 We were there during the ‘Moose Festival’ which consisted of fibreglass moose which had been painted all sorts of original artistic colours located at diffrent points around Bennington. People came from all over to photograph the moose. Go figure. I thought that the best was the huge chocolate moose in the local specialty chocolate shop. We didn’t go for him, but we did enjoy many smaller chocolates, especially chocolate pretzels. 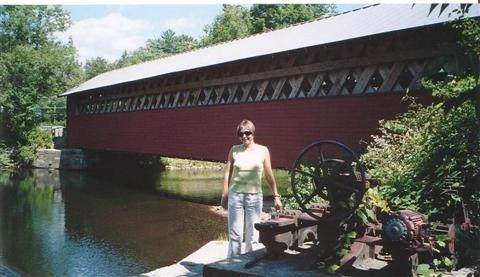 The Bennington area is famous for having several covered bridges and the photo below shows Lis beside one of them. I had always thought that they covered the bridges to keep the snow off them. We visited a museum which showed their history and learned that they were covered to protect the lattice structure from the elements. We decided to treat ourself to a canoe trip down a local river and so hired a canoe and were dropped off at the start point. They agreed to collect us 6 hours later near the New York border. It was a fun trip floating/paddling down the tree lined river, admiring the nature and the farms. There were a lot of people floating in inner tubes which was a good idea as it was a hot day. We negotiated occassional rapids and in one of them a tree lay across, and into, the river. We unfortunately tipped the boat and it got stuck under the tree! After unsuccessfully trying to free it, a few tubers came along and we were able to extract it, with the only damage being to our pride (and Lis losing my precious Tour-de-France hat). I started the tri camp after dropping Lis off at the Albany train station to return to Washington. We had a great crowd of all ages and it was a lot of fun. The camp taught the Total Immersion (TI) swim technique, which is designed for triathletes. We did most of our work in the pool, but also some open water swims in a nearby lake. Glad that I had my wet suit for those! The TI technique has made a huge difference to my swimming. I realized that swimming is about 90% (or more) technique which explained why I was always being smoked in the pool by fat old women who actually know how to swim. Whereas with cycling and running the more you train the better you get, one reaches ‘terminal mediocracy’ with swimming unless you work on your technique. Very few triathletes seem to enjoy swimming, but at least after the camp I have newfound confidence and my performance is much improved. The week before the camp I did a triathlon and was 10th last out of the water; since the camp I’ve exited in the middle of the pack and my legs are stronger. The TI instructors, especially Celeste and Rich, were great and all of us improved a huge amount over the week we where there. One guy brought his 11 year old son who couldn’t swim the length of the pool on the first day; after a week he completed a 800 yard open water swim. We also did running and cycling, again with professional coaches. It was fun to train with people for several hours a day, and also to socialise and hang out. It was a great holiday. We closed the camp by competing in a triathlon. It was great to put our new found skills to use, and even more so to have a bunch of new friends to race with. Triathlons are individual sports so normally it is just yourself and (hopefully) your spouse cheering you on. With some 20 of us racing there was always someone to catch, pass or cheer on. The best part was watching the youngsters in the race. There were two 11 year olds and a 17 year old. All of them did well and I think, at least for the 11 year olds, they got a real boost to their confidence. It would be interesting to meet up again one day and see how they ended up. 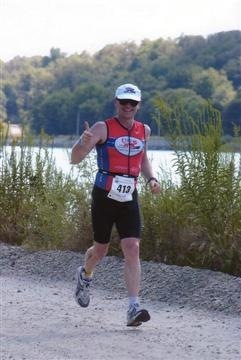 My last race of the season was the Diamondman a half-ironman (70.3 miles under my own steam in 5:09) in late September. My race log for that race is here. The race went well and I was still smiling at mile 6 of the half-marathon. It is interesting having done a half-ironman. There is no way I could ever do a full ironman (140.6 miles). It is possible to do a half-ironman (and even shorter distances) while only training about 12 h a week (which is what I do). people who do the full ironman do much more training, minimum 20 h a week, and I don’t know how their bodies can take it. 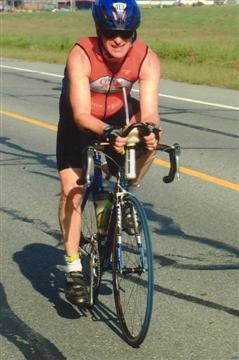 I read recently that each week, the average ironman competitor swims 12,000 yards, cycles 230 miles and runs 48 miles. No wonder some are questioning the wisdom of doing too many ironman races (there is an excellent article on this at http://www.slowtwitch.com/mainheadings/opinion/70.3.html. Next year I’ll do a couple of half-ironmans, as well as some Olympic distance triathlons. They really are fun, in a masochistic sort of way. I turned 46 September 3 and we headed down to the Greenbriar Trail in West Virgina with Raoul and Ligia Pop, friends from church, for a weekend of cycling in nature. The trail is a 75 mile long route which used to be a railway line. It runs next to a river and so is wonderful for cycling along. There are tunnels, bridges, and a good riding surface. We rented a cabin next to the trail so just had to walk out the door to be on the way with our bikes. It was fun to have Raoul and Ligia along. 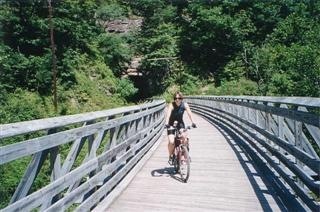 Even though they were not as strong cyclists as Lis and I, we all enjoyed the trails and the riding. I had my half-ironman two weeks later so also did some road riding and running, which was a treat as the roads were empty and scenery spectacular. On Monday we treated ourselves to a ride up a mountain on a steam train. 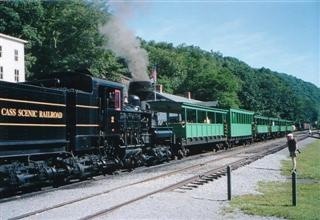 Originally used for timber extraction, the ‘Cass Scenic Railroad’ is a mecca for rail buffs. There are several steam engines which take you for a trip to the top of a mountain. In some places the gradients were so steep that the trains have to zig-zag up the mountain by going foreward and backwards. As we ascended the mountain it was hard to picture what it was like 50+ years ago: completely denuded of trees. Half-way up the mountain the train stopped so we could inspect an original lumber camp. Primative to say the least. I couldn’t imagine being up there in winter in these simple shacks. Lis and I always view railway rides as somethng special, and with the steam train sounds, smells and open carriages it was extra fun. 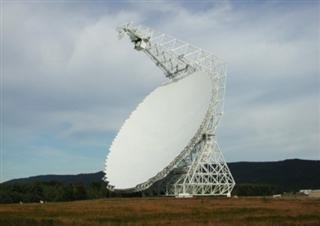 Travelling back to D.C. we stopped at the ‘National Radio Astronomy Observatory’ at Green Bank. They had an excellent tour which explained the basis for radio astronomy and then took us on a tour of the telescopes. They were huge and one of them is purported to be the largest movable land structure ever built (the dish covers 3 acres). I would believe it. They also featured the first radio telescope ever built. A fellow built it in his back yard in Chicago, using a Ford Model T drive train to move it around the circle. I could never imagine Lis letting me do that! They told us stories of how this part of the US is a ‘dead zone’ with restrictions on electro-magnetic radiation. Originally established in the 1940s, this means that cell phones don’t work, there is limited radio and TV reception, etc. It was interesting to hear their stories of how they will sometimes get major interference and so they have teams of vehicles equipped with sensors that travel to find the sources. Sometimes the cause is as banal as a bad plug on an electric blanket, or a problem with an electric fence. The stories were very entertaining and Raoul has decided to compile them for a book. It was back to China late September for another mission. 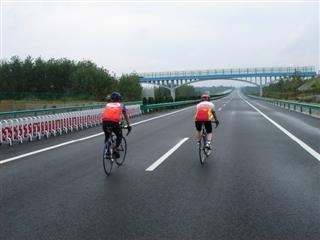 This time I took my bicycle since I was celebrating the opening of the Xiaogan – Xiangfan expressway (XXE). When my Chinese colleagues learned that I had cycled across the USA San Francisco-Maine, and mountain biked the Rocky mountains from Canada to Mexico they joked that I should bring my bike and inaugurate the XXE. I of course accepted so that is how I found myself riding on an empty brand new 150 mile expressway with a few friends. It was one of the highlights of the year for me and the ride log is here. The local Chinese TV company filmed it — most people cut the ribbon, they don’t ride their bikes — and we prepared an extract for the Bank of their film. You can play it here. You need the Realmedia player installed to view it. One of the best aspects to my work is the number of different areas that I can get involved with. This year I have been focusing on two issues, in addition to my regular job: HIV/AIDs and traffic safety. When I mention HIV/AIDs most people wonder what that has to do with building expressways. Quite a lot actually. Migrant workers spend 11+ months away from their families with not a lot to do in their spare time so are a major vector for HIV transmission, which will also then impact on the local residents where we are building our roads. Although China has a low HIV incidence right now, it is rapidly increasing. With the support of the Hubei Provincial Communications Department I secured a grant to start the first HIV/AIDs education program in China aimed at construction workers on expressways. I have since been able to secure two new grants for other projects and I am now leading the East Asia Transportation Unit’s HIV/AIDs team for East Asia. We are committed to doing similar activities on all of our transport projects, which will hopefully make a huge difference. With regard to traffic safety, it is a big problem in China. About 150,000 are killed each year, and 5.5 million are injured. With the support of a grant from Sweden, I am trying to start a special project aimed at improving traffic safety (again in Hubei who are very forward looking). This will bring together engineering, enforcement, education and medical into a single strategic framework. 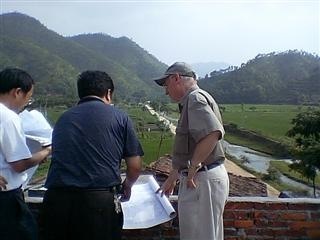 I hope to complete the project design in 2006 and then win support to implement it. Many people aren’t clear on how the World Bank operates. If you really want to know, read the book ‘The World’s Banker’ which is a biography of the previous president Wolfensohn. This goes into a lot of the behind the scene machinations at the Bank, and describes things which most of us peons are not aware of. Basically, the Bank lends money to developing countries which it raises on the bond markets. The 81 poorest countries (where the per capita income is less than $965/year) get long-term interest free loans, while the other countries pay interest on their loans. The funds are used to finance infrastructure (my area), education, health and other activities. The World Bank’s vision is ‘A World Free of Poverty’, and I am lucky to be able to work at such an institution. Yes, it has its problems, but I do feel that my work is more meaningful than when I had my own consulting company. A good thing given that I took a pay cut to join the Bank! For more information on the Bank visit www.worldbank.org. Lis and I have enjoyed living in the D.C. area (myself more than Lis). There is a lot to do here and the nature can be quite beautiful. 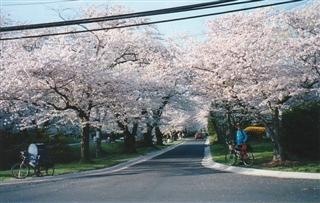 During spring the cherry trees bloom and this year we enjoyed cycling through a neighborhood which had street after street of cherry trees. When the wind blows you have what looks like snow as all the petals float through the air. In downtown D.C. by Thomas Jefferson’s tomb they have the ‘Tidal Basin’ which is lined with cherry trees. Tourists come from all over to admire them, so during our lunchtime runs Jerry Lebo and I play dodge the tourist. It really is great. 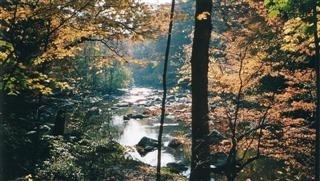 The Potomac river is another resource. Lis and I have been out on it in our sea kayaks a few times, and the photo to the right was taken about a 15 minute drive from our house. The big challenge in the US with kayaking is finding places to put in your boats. Even outside of the city, launch places are few and far between. 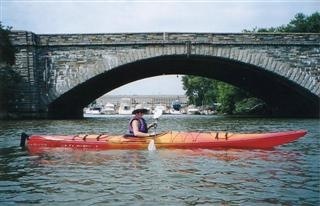 We’ve enjoyed kayaking on the river and in 2006 we will explore more of Chesapeake Bay. Annapolis, home of the US Naval Academy, is only an hour from us and it’s a great place to explore the Cheasapeake from. We are very fortunate where we live. Arlington Virgninia is across the Potomac from D.C. and was originally part of the city until some time in the 1800’s when it reverted back to Virginia. It is only two blocks from our place to the bike path, and from there 25 minutes to the Bank. The neighbors are great and there is a good community spirit. In July they closed the street for a block party where we visited each other, sat in the street and chatted. One neighbor even supplied us with our very own fireworks display. 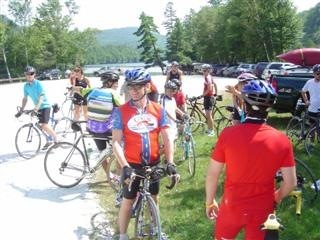 There are several other cyclists and even one ultramarathoner (50 miles+) so it is an active group! 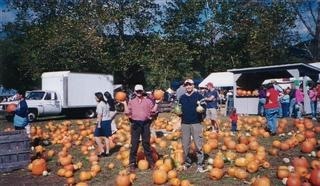 It is very easy to escape into the countryside and in autumn we went to a local pumpkin festival with some friends. Although aimed at children, we all had a good time with a hay ride, lots to eat, and fresh apple picking in the orchards. Since pumpkin pie is one of my favourite dishes, I rather enjoy autumn. There are lots of cycle paths and the photo below is taken on one that goes from central D.C. up into Maryland (Rock Creek Parkway). Unfortunately, the colours of autumn is followed by the bleakness of winter, which Lis copes with by using my frequent flyer miles to escape to New Zealand. This has gone on for a while so perhaps time to end it. Looking back at 2005, it was a year of new experiences, lots of travel, and catching up with old friends. It was also a time of personal and professional growth. As I approach 2006 I thank the Lord that He has kept Lis, myself and our families healthy, and that we continue to grow in his grace every day. I thank Him for friends, far and near, who although we don’t often see (and in my case write) we think about and hope to see again. You are currently browsing the World Bank Traveller blog archives for December, 2005.